With the caveat that alcohol should only be consumed in moderation for health purposes, here is a quick story with a hangover cure you might not know about. It is…asparagus. That’s right; not only is it a very healthy vegetable, but it is also a hangover cure. That is, according to a study in the Journal of Food Science. According to this health breakthrough, asparagus contains certain amino acids and minerals that can alleviate alcohol’s disagreeable hangover. Also, it can protect the cells of your liver from toxic damage. PLUS: Asparagus may fight skin damage. Korean researchers analyzed the components of young asparagus shoots and leaves to compare their biochemical effects on cells. 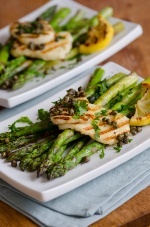 They found that amino acid and mineral levels were much higher in the leaves than the shoots of the asparagus. What’s more is that toxic levels in those cells were significantly reduced when extracts from asparagus leaves and shoots were used. Asparagus is a very commonly cultivated vegetable available around the world, year-round. Few of us know that it has long been used as an herbal cure due to its potential anticancer effects. It also carries the capacity to fight fungal infections and inflammation, and repair urinary issues. So, the day after drinking a little too much alcohol, maybe pan-fry some asparagus along with whatever meal you are concocting. Kim, B., et al., “Effects of Asparagus officinalis Extracts on Liver Cell Toxicity and Ethanol Metabolism,” Journal of Food Science 2009; 74: H204–H208.